AirAsia India today (August 10th 2015) announced that the airline hit “the 1 million guests flown mark a little while back”. The Flying Engineer had forecasted in June 2015 that the airline will fly its millionth passenger on or around August 5th. It is likely that the airline may have flown its millionth passenger around the forecasted date. Interestingly, the CEO of AirAsia India had told The Hindu Business Line in May 2015 that the airline will fly its millionth passenger before June 12th 2015 (first anniversary of operations), and later had told Forbes India in July 2015 that the airline will fly its millionth passenger in July 2015. 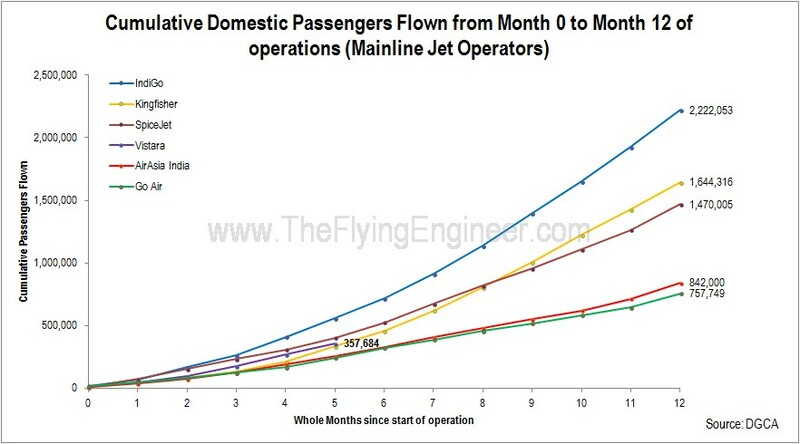 Among all airlines to have started operations with mainline jets (Airbus A320 or Boeing 737 aircraft), AirAsia India’s growth (in terms of passengers flown) has been better than only GoAir’s. While GoAir’s average aircraft fleet in the first year of operations was higher than AirAsia India’s, but flew with poor load factors. Air Deccan is not considered as the airline started operations in October 2003 with 48 seat ATR-42 aircraft and inducted its first Airbus A320 only in July 2004 – 9 months after starting operations. Until the issue of flying international is resolved, AirAsia India may induct just one other Airbus A320 into its fleet by the end of the calendar year 2015, taking the total fleet size to 6. Vistara will however induct 3 more to take the total fleet size to 9 aircraft by the end of the calendar year. Vistara’s total passengers flown at the end of the fifth full month of operations (June) is slightly better than what Kingfisher flew in the corresponding period. Vistara may have flown close to 450,000 passengers towards the end of July 2015, since start of operations. The airline is expected to fly its 500,000th (half millionth) passenger during the second or third week of August 2015. FAA Gives Santa, Sleigh & Crew a “GO” for Launch! This Christmas, the FAA gives you a chance to track where Santa is! click on the image above to see where he is right now. The FAA has taken all necessary steps to ensure Santa’s flight is uneventful, and safe, so that all “good boys and girls everywhere” may get the gifts they deserve. From Santa, of course. New equipment, and a crew member, Amelia Elfhart (the spirit of Amelia Earhart? ), who meets the mandatory 1500 hours on type, have been approved by the FAA. “This is my first holiday season as Secretary of Transportation, and I feel a special responsibility to make sure Santa’s flight goes off without a hitch,” said Transportation Secretary Anthony Foxx. According to the FAA, while there were no external changes (read: aircraft mods) to Santa One this year, FAA inspectors put in many hours ensuring that the sleigh’s systems – and especially its crew – met all applicable regulations. The agency approved installation of a state-of-the-art WiFi system so Santa’s helpers can use their Portable Elftronic Devices (PEDs) to connect with the internet. Thanks to the FAA’s policy change in late October, the elves may now use their PEDs from takeoff to landing to keep in touch with the North Pole. The Jolly Old Elf himself will employ modern computer technology in the sleigh’s Captain’s seat. After an evaluation period, FAA inspectors gave Santa a thumbs-up to use a tablet computer instead of paper documents to store his flight plan, chimney approach charts and Naughty-or-Nice checklist. “We’re helping Santa fly smarter and faster while making sure he has a safe and successful mission” said FAA Administrator Michael Huerta. Pilot issues occupied much of the FAA’s Santa-related activities this year. Inspectors verified that Santa has an appropriate flight, duty and rest program, and that Santa One has an approved crew rest area. The FAA also confirmed that Santa’s First Officer, Amelia Elfhart, has the required 1,500 sleigh piloting hours and Santa One type rating. Santa made sure he could continue to serve as Sleigh Captain by completing a new FAA-approved Sleigh Transport Pilot training program. You can follow Santa’s flight at the NORAD Tracks Santa website: www.noradsanta.org.